Who doesn’t love butterflies? While most people won’t think twice about destroying a wasp nest on the side of the house, spraying a swarm of ants in the driveway, or zapping pesky flies at an outdoor barbecue, few would intentionally kill a butterfly. Perhaps because of their beautiful colors and intricate patterns, or the grace of their flight, butterflies tend to get a lot more love than other types of insects. As a caretaker of one of the world’s largest collections of preserved butterflies and moths, and as a very active field researcher, I spend a lot of time explaining why we still need to collect specimens. All these cases of dead butterflies contribute greatly to our understanding of their still-living brothers and sisters. Collections are vitally important – not only for documenting biodiversity, but also for conservation. 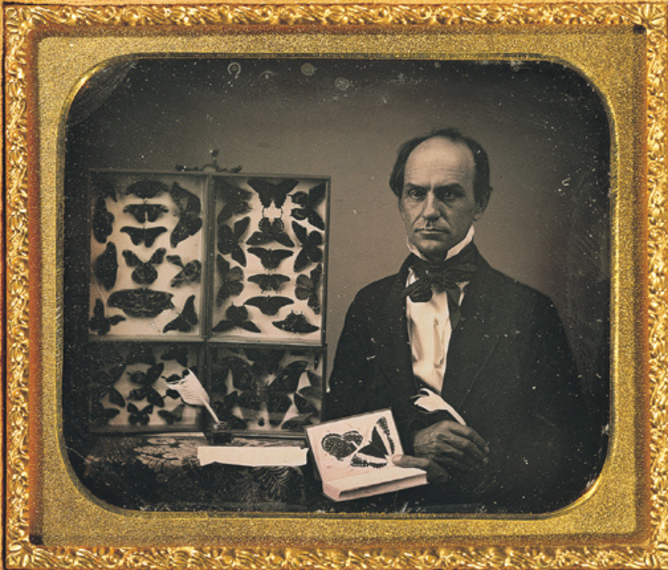 Collectors have archived butterfly specimens for hundreds of years. Museums are storehouses for information generated by everyone who studies the natural world. 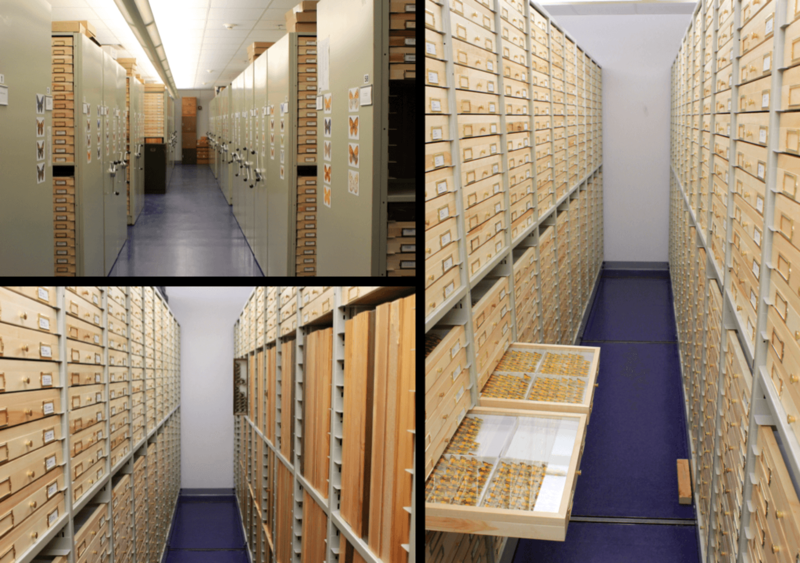 Natural history collections constitute the single largest source of information on Earth’s biological diversity. Most of what we know about what lives where and when is derived from museum collections, accumulated over the past two-and-a-half centuries. The author searching for butterflies in Colorado’s Rocky Mountains. Methods of field collecting have changed little since butterfly collecting became popular in Victorian times. The butterfly net remains the primary tool of the trade. Most butterflies are attracted to flowers, although bait traps – with fermenting fruit, putrid liquefied fish, mammal dung, or even carrion – are used to attract certain species. Butterflies live pretty much everywhere that has native plants. Many species are highly seasonal in occurrence, some only on the wing for a couple of weeks each year. Since most butterflies stay close to their caterpillar foodplants, even as adults, the best way to find a particular butterfly is to search out an area where its favorite plant grows in abundance. Recently pinned butterfly specimens, now dry, being removed from the spreading board. Upon arriving home, collected specimens are pinned, with a single pin through the body (thorax). We position the open wings on a flat board so they’ll remain in the spread position once the butterfly has dried. Then we stick a label to the pin, indicating exactly where the specimen was collected, when and by whom. Dried specimens are extremely fragile and need to be protected from pests, light and humidity; if this is done successfully, specimens may last indefinitely – the oldest known pinned butterfly specimen was collected in 1702! It’s these collected specimens that enable detailed studies of anatomy. These studies in turn contribute to taxonomy, the science of classification, which provides a basis for communication about organisms across all disciplines. As genetic technologies continue to advance, museum collections are increasingly important resources for DNA-based studies on taxonomy, climate change and conservation genetics. Views of the butterfly collections at the McGuire Center for Lepidoptera and Biodiversity, Florida Museum of Natural History. Despite their status as most-favored insects, there are still many undiscovered, unnamed butterflies, all over the world. Every year, we discover new butterfly species. Just like flies, beetles and wasps, a significant percentage of butterfly species remains to be formally identified, named and classified. This is especially true in tropical areas around the world, where new butterfly species are discovered on a monthly or even weekly basis; eight new tropical butterfly species have already been named in 2015 in just one journal! 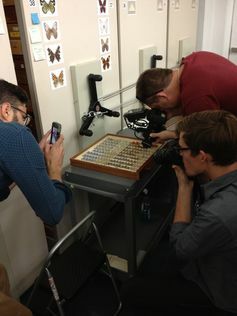 Photographing butterfly specimens that were collected in England over 100 years ago. Discoveries aren’t exclusively made in exotic, hard-to-reach locations, though. New species are frequently found within existing museum collections. When specimens are closely examined (or reexamined) by experts, it’s not unusual to find multiple species among what was previously considered just one. Such discoveries are made through traditional anatomical studies, as well as through newer DNA-based technologies, which can detect multiple species among specimens that appear, to our eyes, to be identical. New species’ names become officially available for use once the formal description is published in a journal. There are rules that researchers must follow for their names to be considered valid, dictated by the International Code of Zoological Nomenclature. Even so, debates over the rank of a particular name are common, and what is originally described as a new species might be considered to be merely a subspecies of an existing species by other scientists. In most cases, over time and through independent investigations, consensus on the appropriate rank for each name is usually established. Even though dozens of books and guides to the butterflies of the United States have been written, surprising new discoveries continue to be made here. New species are even being discovered among our largest and showiest butterflies, the swallowtails. Male of the Appalachian Tiger Swallowtail (Pterourus appalachiensis) from Clay County, NC, described as a new species in 2002. 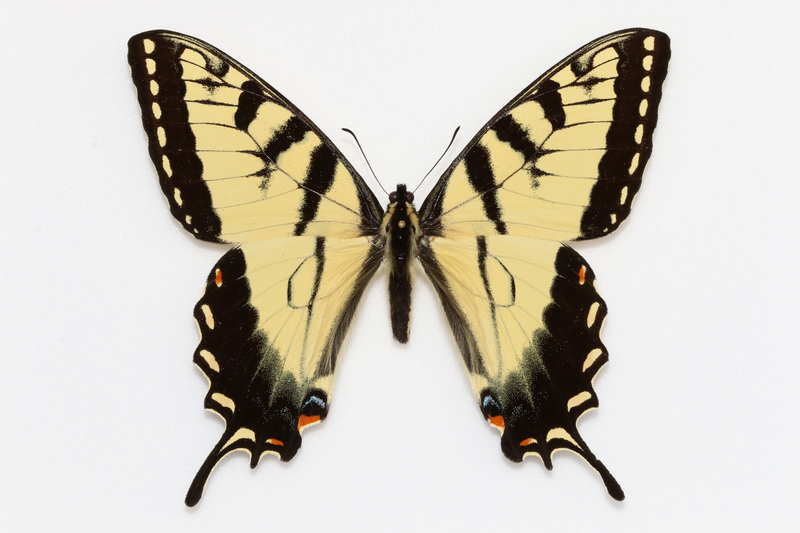 In 2002, the Appalachian Tiger Swallowtail (Pterourus appalachiensis) was described as a new species, based mainly on differences observed in recently collected specimens. Subsequent ecological and molecular studies, resulting from the collection of specimens in all parts of its range (as well as throughout the ranges of related species), coupled with the study of museum specimens, have supported the species-level status of this large and conspicuous southern Appalachian butterfly, which appears to have evolved through hybridization between Canadian and Eastern tiger swallowtails. Male of the Western Giant Swallowtail (Heraclides rumiko) from Cameron County, TX – only discovered and named in 2014! Last year, another new species of swallowtail butterfly was described from the United States, the Western Giant Swallowtail (Heraclides rumiko). This butterfly was “split off” from the Eastern Giant Swallowtail (Heraclides cresphontes) based on subtle but consistent differences in wing markings and in the form of the male and female genitalia, as well as in the DNA barcodes, small snippets of DNA taken from the same gene and compared across many species. This cryptic diversity was revealed through the study of numerous museum specimens, as well as through recent collections in areas where the two species meet in Texas. 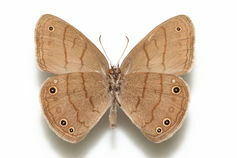 Despite being widespread in eight southeastern states, the Intricate Satyr was not detected as a new species until late in 2013. 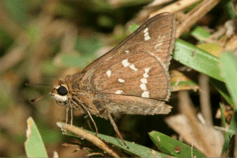 Late in 2013, the Intricate Satyr (Hermeuptychia intricata) was described from the southeastern United States. 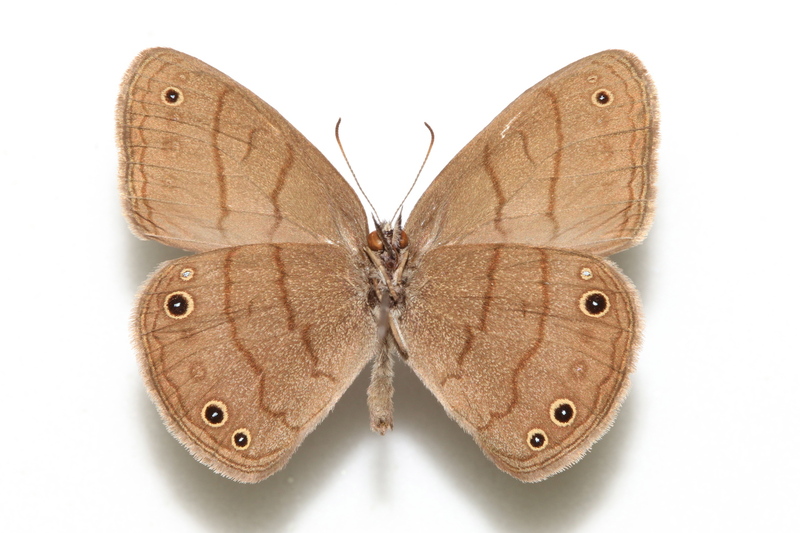 It was first detected when specimens from a faunal survey of a Texas state park were DNA barcoded, and two distinct barcode groups were identified in what had been called the Carolina Satyr (Hermeuptychia sosybius). Upon closer examination, consistent differences were also observed in the genitalia of the two groups. A subsequent review of specimens in museum collections showed that the Intricate Satyr ranges broadly across eight southeastern states, and that, most of the time, adults can usually (but not always) be identified based on wing markings. These examples are striking reminders that new species remain to be discovered even among the best-studied faunas, and that ongoing collecting coupled with the study of museum collections continues to play an important role in revealing biodiversity. While specimens of all three of these new butterfly species existed in museum collections before they were formally recognized as new, all of them were initially revealed as unique through differences found in recently collected material. 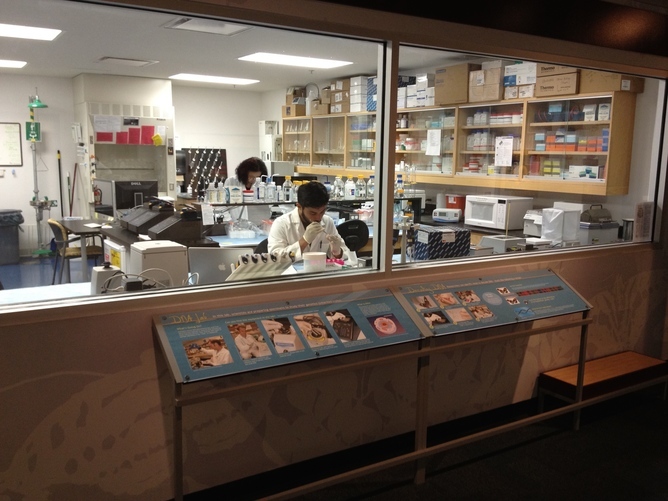 Researchers extracting and sequencing butterfly DNA in the molecular lab at the McGuire Center for Lepidoptera and Biodiversity, in view of museum visitors. Genetic data are widely used in management plans for rare and endangered species, and butterflies are no exception. Due to their generally small size and the current limitations of technology, studies of butterfly population genetics almost always include the collection of specimens. DNA quality rapidly deteriorates in museum specimens, so for detailed genetic information, fresh specimens almost always need to be collected from the wild. Male Crystal Skipper (Atrytonopsis sp. ), Carteret County, NC. One of the rarest butterflies in eastern North America is an as yet undescribed species, widely known as the Crystal Skipper (Atrytonopsis sp.). This species is found only in a small part of coastal North Carolina, and is of considerable conservation concern. Genetic studies resulting from samples taken at all known sites where the butterfly lives have shown that three distinct genetic groups exist across its limited range. Thus, if we aim to preserve the genetic diversity of this species, multiple sites will need to be maintained as suitable habitat across its range, not just one or two adjacent areas. A recent paper suggested that collecting for scientific studies can contribute to the extinction of species. However, scientists studying various animal and plant groups widely contested this notion. Males of the Xerces Blue. Formerly found in San Francisco, but driven to extinction in the 1940s due to habitat destruction. Due to their population dynamics, with a single female often laying hundreds of eggs, collecting a few butterfly specimens, even in a small population, would be unlikely to have a detrimental effect. The only proven method for driving a butterfly to extinction is habitat destruction and fragmentation. Sadly, there are many examples of butterflies that have been exterminated in this manner – the most famous in the US being the Xerces Blue. Now, these extinct species can only be seen and studied in one place – a museum collection. Andrew Warren is Senior Collections Manager at McGuire Center for Lepidoptera & Biodiversity at Florida Museum of Natural History at University of Florida.